How can you resist? 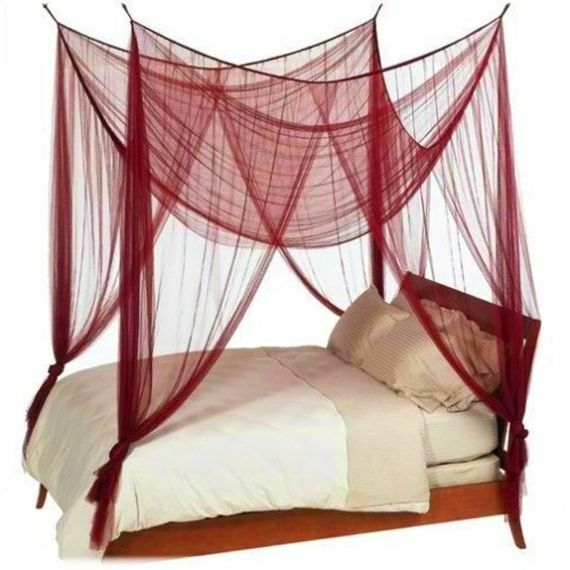 Make your bedroom a romantic haven by adding a luxuriously soft four-point mosquito net canopy overhead. You can make any old bed a four-poster canopy bed. You can even hang it on top of an existing four-poster canopy bed if you'd like. It's like investing in a new bedroom set at a tiny fraction of the cost. Our yummy four point bed canopy fits beds up to King Size! For smaller beds, simply drape the fabric down lower in the center. 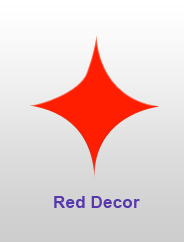 Use one to cover seating areas, tables, and outdoor settings. Use this incredible canopy totally closed, open, tied....there are so many things you can do with this. Each corner has two sections of fabric. This four-poster romantic bed canopy is SOOOOOO easy to put up. It's one piece. At the top of each corner is a 3" long fabric loop to attach to the ceiling. Your canopy will come with four screw-in "c" hooks as well as drywall screws to hold them tightly in your ceiling. Seriously it will take you just a tiny bit of time to figure out how you want to hang it and then to get it done. 100% Polyester Netting-Deep Red 78" wide, 86" Long, 96" High. Hand Washable for easy care! - We also offer a huge selection of matching accessories like beaded curtains and lamps that will really help you to tie the look of your room together!